When you’re an owner and CEO of two major league franchises your time can be short, so one would think that Bills and Sabres owner Terry Pegula would need to have regimented schedule to have time for all the interactions that need to take place between his front office staff for the two clubs and the head coaches. But Pegula prefers to do just the opposite and meet on an impromptu basis with Bills GM Brandon Beane and head coach Sean McDermott. The approach makes sense knowing Pegula, and his wife and co-owner Kim, can be pulled in any number of directions at a moment’s notice with all their companies, holding and properties that demand their attention. Bills new head coach Sean McDermott isn’t the only one who does his research. So too did Terry and Kim Pegula when they became new NFL owners. That’s why their power structure of having the GM and head coach report to ownership remains in place. In an appearance on the John Murphy Show, Bills owner Terry Pegula explained the current structure with McDermott now in place as head coach, and added that it’s common practice in the NFL. “I told (Sean) the GM and the Coach work together,” said Pegula. “Obviously Doug (Whaley) is sitting in the room with him while he is interviewing so he knows if he is hired by this GM, this GM should like him. It is not like we are bringing in a new GM in and hiring him as a coach first. This GM and coach working together and they both answer to the owners. Interviews for head coaching positions are known to take a good deal of time. Some take four hours, some longer. Some are broken into two parts with a couple of hours each day. Sean McDermott’s with the Bills went almost seven hours straight. That according to Bills owner Terry Pegula, who GM Doug Whaley had first on the interview list for a reason. In an interview with USA Today’s Tom Pellisero, Bills owner Terry Pegula cleared the air on media reports that he gave GM Doug Whaley and head coach Rex Ryan an ultimatum that the team had to make the playoffs in 2016 or they’d be out of work. Bills owners Terry and Kim Pegula have been at the helm for almost two calendar years, and not a lot is known about how they like to run their professional sports franchises. Terry Pegula shed some light on that subject Wednesday on the John Murphy Show. After denying the reports from last December that he issues and ultimatum to Doug Whaley and Rex Ryan to reach the playoffs or they were out (he was at his lake house in the Adirondacks at the time the report was made), he was asked on the John Murphy Show how he likes to operate his professional sports teams. Pegula referenced top to bottom and bottom to top communication within his franchises as essential. Buffalo Bills owners Terry and Kim Pegula took part in the Business First power breakfast panel on the “Business of Sports” Thursday at Buffalo River Works. They were joined on the panel by Delaware North chairman and Boston Bruins owner Jeremy Jacobs, Buffalo Bisons owners Bob and Mindy Rich and NHL Commissioner Gary Bettman. “Our mission, I believe, is to help foster and improve the quality of life here through these sports teams.” Terry Pegula said. 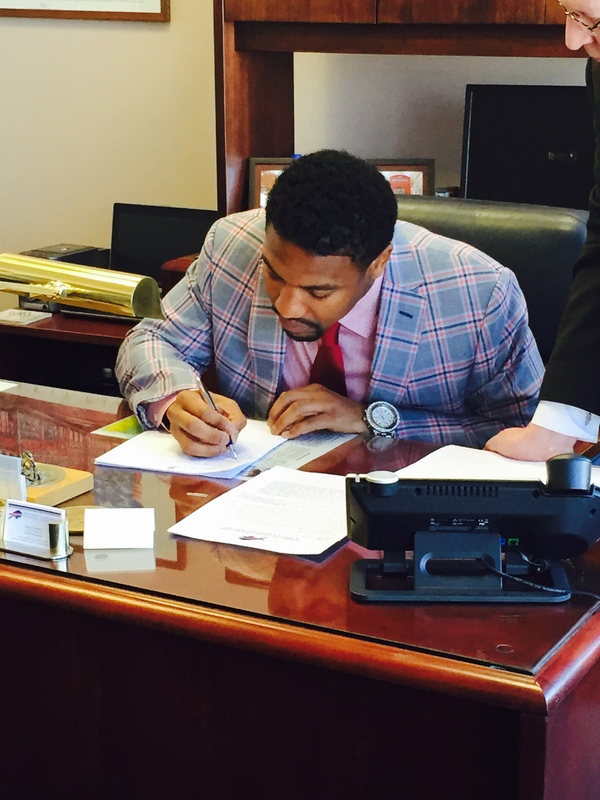 Not long after he signed his new contract with the Bills Monday morning, he got on the phone to speak with owner Terry Pegula. In a sit down interview that will appear on Buffalobills.com later today (Monday) he talked about his exchange with his owner. The self-motivated Hughes said knowing he had teammates in Buffalo who were just as motivated to complete the team’s turnaround and reach the postseason was a factor in his return. The Bills have now officially signed veteran G Richie Incognito. The free agent agreed to terms over the weekend. Bills owners Terry and Kim Pegula made a point of meeting with Incognito personally to allay any concerns one might have knowing Incognito’s past. Terry Pegula issued a statement about that meeting as the team made Incognito’s signing official Monday. Bills Hall of Fame QB Jim Kelly has a trained eye when it comes to offensive football. Knowing that side of the ball is in need of the most improvement in Buffalo, he’s willing to provide input if new head coach Rex Ryan wants it. Kelly said as much following Ryan’s introductory press conference Wednesday, confirming that he’ll be meeting with owner Terry Pegula in the wake of his talk with Ryan Tuesday night. “I’m not looking to do any coaching. I’m hopefully in a short time sitting down with Terry and talking with him,” said Kelly. “I’ve already talked to Rex about a few of my ideas. But right now he needs to settle in. He needs to understand who his staff is. Yeah I’d like to give my two cents where I feel it’s needed, whether it’s the quarterback position or the wide receiver position, two positions that I feel are my strong points. “He’s putting his staff together, but I would love to sit down and say, ‘This is good, this is bad.’ I am an armchair quarterback, but I don’t look at the game like a typical fan does. I don’t follow the ball. I follow what receivers do if they’re being bumped. I follow what coverage it is. I follow when the linebackers are blitzing and rotating and where the quarterback should be looking. I look at the game completely different than your average fan. I look at it as a quarterback. Terry and Kim Pegula along with GM Doug Whaley and team President Russ Brandon went on a barnstorming tour to find a head coach. As they made their way through a dozen candidates it became clear what they felt they needed in a head coach for their team at this time. “When we went through this process, we went into it open-minded,” said Terry Pegula. “We interviewed some bright, young coaches and some veteran coaches and Doug and Russ obviously had been through this before a few years ago. Like I said, when we meet the right guy, you’ll know it. When we finally talked to Rex and looked at that staff that he put together, I really don’t think that the Buffalo Bills at 9-7, and I really believe two plays away from possibly being 11-5, needed to have a young coach standing in their locker room. “I thought we needed to go to somebody who’d done it before and if you look at the record of almost every coach like Rex just mentioned it, new coaches fail generally in their first job and I’m not saying that all the new coaches that are going to get hired are going to fail, but it’s more happening in that direction than it is for them to be successful. The Bills front office structure has undergone some change since the Pegulas came on board as the owners of the club. Now with Rex Ryan as head coach, Terry Pegula laid out how the flow of information will proceed between himself, his wife Kim and the highest ranking officials in the organization. Team President Russ Brandon further expounded on the duties and responsibilities held by the top three ranking executives under the Pegulas. New owner and CEO Terry Pegula talked about the steps he and his wife Kim took to get to know some of the owners in the NFL, while also sharing a bit about themselves. In a one-on-one interview with Buffalobills.com, Pegula explained how they went to meet three of the league’s influential owners long before the league’s ownership contingent was to vote on them at the league meetings. Pegula also said that they made of point of staying silent after signing the non-disclosure agreement with the Wilson trust. They even went so far as to not respond to inquiries from other prospective owners that were seeing if the Pegulas were interested in partnering up in an effort to buy the Bills. Jeff Littmann, Mr. Wilson’s CFO for the Bills provided additional comment on behalf of the Ralph C. Wilson Foundation and in the process commended the Pegulas for their handling of this ownership transition process. Littmann first pointed out that the final step in ownership transfer is the purchase transaction, but he expects that to be handled in short order. “They have been absolutely wonderful to work with everything has been first class through the process so we think this will go swiftly, and will check that box and we’ll be on our way,” he said. Littmann also said the outgoing ownership will do whatever necessary to assist in the initial steps of ownership transition with the Pegulas. He also said the Ralph C. Wilson Foundation is still in the initial planning stages and will unveil their plans when they are finalized.